360 Yoga for Seniors Dedicated to a dear friend and supreme yogini Reta. 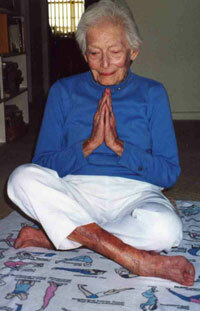 I took this photo of her (one of many yoga pictures) during our weekly private sessions when she was 103 years young! Of course you notice she's on the floor in one of her favorite hatha yoga poses (she loved to use the colorful yoga towel I designed in the '90s). Yogini Reta was a celebrity of sorts in So. Florida, often appearing in newspapers demonstrating a few hatha yoga poses. She made her transition just three weeks shy of her 104th birthday. During her last year on this Earth Plane she asked me to train her how to teach yoga. At first I admit I was stunned. Then I just smiled and said, "of course." After discussing the need to teach easy yoga poses like we do in chair yoga, she scoffed at the idea. "If I can perform regular hatha yoga poses then so can they," she said. She DID teach yoga for seniors, a small group of women in their 80s and 90s. When I asked her how she enjoyed teaching her first class, she said, "Well, good but...the only thing was trying to get those old ladies on the floor with me!" about this author This is one of many yoga pictures I captured of Reta (age 100) after one of my group yoga for seniors classes. She attended every day, five days a week. And I don't mean chair yoga, regular asana practice on the mat! I met her when she was 89. We became close yogini friends for 15 years; I'm so blessed. She was great at doing so many hatha yoga poses. Here she demonstrates very nicely the Half Spinal Twist, Ardha Matsyendrasana. Oh yes...did I mention she got her Masters Degree from Columbia back in the 1940s? Hmm… not too many women accomplished that back then, huh? She was so wise! I enjoyed spending time with her -- in fact, I deeply cherished it. Here she's demonstrating the Cobra, Bhujangasana, definately one of her favorite hatha yoga poses. She was 100 years young at this time (maybe 101), inspiring her classmates doing yoga for seniors with great ease and grace. She arrived invariably early to classes. Reta always sat up-front and center, then promptly assumed Corpse, Savasana, for a few minutes to relax and prepare herself for the other hatha yoga poses to follow. 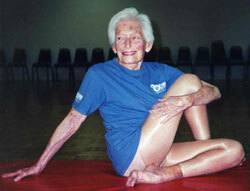 Many "younger" students in their 60s - 90s would stare in amazement as she effortlessly practiced 'yoga for seniors.' She never complained that practice was hard. If a newer student (let's say someone in their 70s) said they couldn't do a pose -- especially an easy one -- I'd have them look up front. Then I'd say, "Okay...that yogini is 100 years old. If she can do it...maybe you can too."